+ Homan A. Zadeh, M.D., M.P.H., Inc.
+ DenBoer Engineering and Construction Inc. 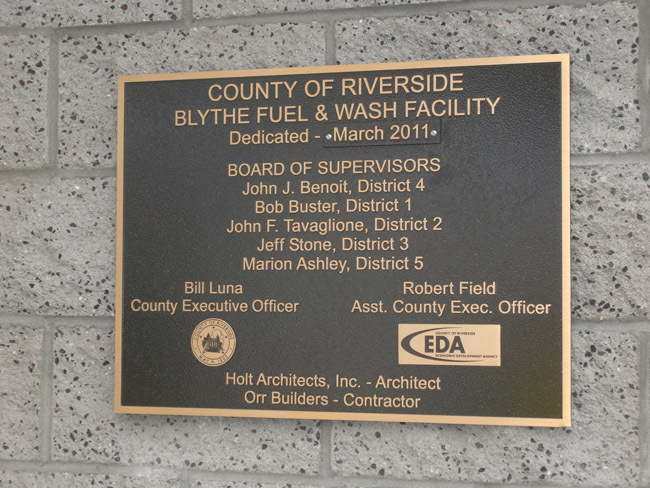 The Blythe Fueling and Car wash brings to Blythe the opportunity for all the Riverside County Fleet Vehicles to get their vehicles washed, filled up and back on the road. Currently the vehicles are washed by either juvenile delinquents serving time or the Riverside County Fleet Manager Eric. The new facility (across the alley from the old) took the place of a residential property that the County secured, so we started this project removing "this old house" then re-graded the site for the new masonry structure that houses not only the car wash itself but the electrical room, I.T. room (this way they can see and tell who is getting gas and a carwash) a vending room and restroom. 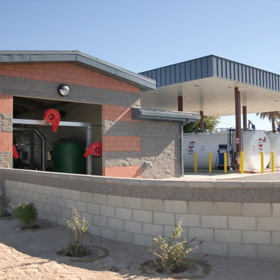 The fuel storage consists of two (2) 12,000 gallon tanks, one for E85 fuel and the other for unleaded.